David Lacz at Bartram & Brakenhoff asks me to announce a further $245,000 price cut on his listing for sale, the 41.7m motor yacht Syrenka. Syrenka was built in aluminium by US yard Palmer Johnson and delivered in 1994 with a $2.5 million interior refit in 2012. This popular charter yacht is now appointed with a comfortable new interior featuring supple leathers and soft furnishings in shades of blue, white, ivory and brown. Other notable recent upgrades include extra-wide passageways, an elevator and wheelchair accessibility on three decks. On the main deck a welcoming conversation area leads forward to the dining saloon. One deck up, the spacious and very private sky saloon is the yacht’s central gathering spot with a 50 inch television and a large circular settee. The full-beam master suite on the main deck is tastefully appointed in a medley of fine woods and natural fabrics and includes an oversized en suite bath with large shower and his-and-her heads. Adjacent to this suite is a smaller cabin with a small double bed. On the lower deck are four additional en suite staterooms: a VIP suite with queen bed, two additional queen staterooms, and one twin-bedded cabin. 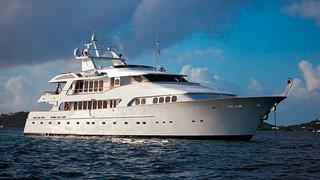 Twin 1,400hp Detroit Diesel engines give Syrenka a cruising speed of 15 knots. Located in Fort Lauderdale, Florida, Syrenka is down from $4,495,000 to $4,250,000.